Mission 5 – Rocket-Propelled Shells! This is where the rocket-propelled-shell-firing teal tanks appear. Formidable at first sight, they are actually easily defeated. In this level, the 2 tanks usually both fire a round at you right off the bet. These rocket-propelled shells don’t rebound, and the trajectories of these initial shots usually form an X, crossing near you. So start the level by moving down a little, and position yourself right under this X to avoid the shells. Then, it is pure procedure. Just follow the General Strategy against Teal Tanks. 5 consecutive shells are fired against a wall with the intention for the shells to bounce off like a line of wave. 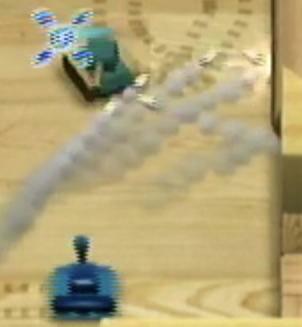 In this case, the sweeping motion (of the turret) during firing is opposite of what it should be (should be from far end of the wall to the near end), and caused 4 of the 5 shells to cancel each other out. This screenshot shows the moment just before this happens. In the end, only the 2nd-to-last shell “survivied”. Had the rebound shots been fired correctly, the enemey tank would have almost certainly been destroyed. it’s TEAL not TEAK! you FOB! Fixed! Thank you, JD Wang of Cupertino & Ontario!